It's a cool autumn night, it's dark, the clouds are hiding the bright harvest moon. The last of the leaves shiver in the trees. As you walk down the road the clouds move, illuminating the gravel with the light of the full moon. Somewhere in the distance a wolf howls. Has your son been acting strange lately? Does he seem unusually hairy and track in more mud than he used to? When you go out has he ordered a steak blue rare? How does he even know that term? How many cooking shows has he been watching? You're sure to have a lot of questions. The hair, the mud, the need for meat: these are all signs of an emerging werewolf. The cooking show obsession is just a sign of his good taste. Many children have been experiencing the same symptoms, your family isn't alone. Yes, your child is probably a werewolf but that doesn't mean the same thing as it did ten years ago. There will be no nights locked in the cellar. In fact, werewolfism has become so commonplace (not to mention cool) people simply make sure their chow chows and chihuahuas stay inside on the full moon. Some neighborhoods even treat the surplus of child-wolves as a pest control solution. Grandma Rosie, on the corner, hasn't had a rabbit nibble on her carrots in months! If your child is going to be a werewolf for life you might as well make sure he's looking tough while he frolics under the full moon. 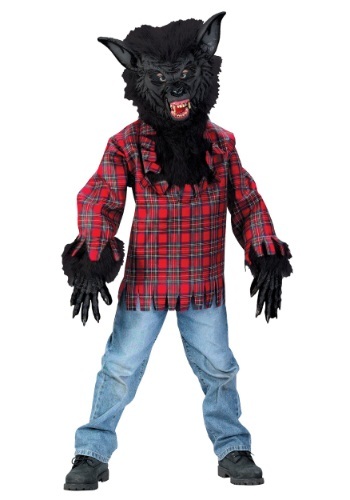 This werewolf set makes sure he's clad in the classic tattered plaid with a fierce werewolf mask and paws. You'll learn to love his new lifestyle. He's sure getting in touch with nature. Maybe you'll even join him one of these moons. That'll give a whole other meaning to the saying "raised by wolves".